Much Ado about Religion, written about 900, is a didactic play that takes on (some) religion in a mix of satire and call for tolerance. Relating directly to conditions in Kashmir of the time, and the local ruler, King Shánkara·varman, and his policies and rule, the arcane specifics remain — despite a brief Introduction and quite extensive textual notes — difficult to fully grasp. Much, however, is also more universal, and so the play is certainly more than of merely historical interest. In Uddaṇḍa Ṥāstrī’s Kokila Sandeśa, written in the 15th century, the unnamed hero in Kanchipuram sends a message with koel or cuckoo to his wife who is near Kochi. This is interesting to historians because it provides social, cultural and historical details of that period. Venetia Ansell has a three part post (1,2, 3) on this. More recently, one of the Kulaśekhara kings of Mahodayapuram (the koel’s penultimate stop), Kulaśekhara Āḷwār, who after gaining power over all of southern India turned to Vaishnavism in a big way and is said to have died en route to Tirupati, is also supposed to have founded the temple. There is no consensus on his dates but he was probably pre-10th century AD. Two copper plate inscriptions – which seem to link the temple to the rulers of northern Koṭṭayam, the koel’s next but one stop – and various other archaeological evidence suggests that the temple was indeed well established by the 10th century. Fëanor translates a French newspaper report on an exhibition about the Royal Court of Lucknow. The golden age of the city was short, the British having ended it in ambush. It started with the accession to power of the ruler Shuja al-Daula in 1754, who made Lucknow his permanent residence. The Nawab attempted to curb the growing power of the British East India Company militarily, which earned him a stinging defeat in 1764. He then signed a treaty with the British in which he recovered his powers of Awadh in exchange for trade concessions and large payments of money. 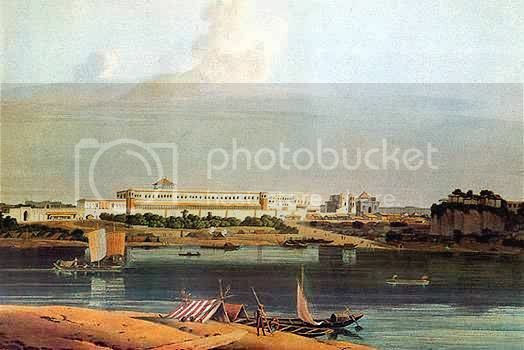 Sriram has a post about Thomas Fiott de Havilland who was responsible for the construction of the Madras Bulwark among many other things. When this was done, de Havilland submitted a proposal to build a bridge across the Cauvery in Mysore with just five arches. To demonstrate his skill in building it, de Havilland erected a great arch in his garden, with a hundred-foot span. The structure became a local landmark and stood till 1937 when it collapsed. The remains of the de Havilland arch are a tourist attraction in Seringapatam even now. The brick bridge over the Cauvery was completed in 1810 in which year de Havilland joined a group of officers who mutinied, protesting against the appalling conditions of the army in Mysore. He was dismissed and returned to Guersney where he was commissioned to construct a barracks. Reinstated in service in 1812, he returned to Madras and became civil engineer and architect of the Presidency in 1814. Interior of the Secundra Bagh After the Slaughter of 2,000 Rebels, Lucknow, 1858 and Chutter Manzil Palace are two pictures taken by Felice Beato who was in India shortly after the Anglo-Indian war of 1857. If you find interesting blog posts on Indian history, please send it to varnam.blog @gmail or as a tweet to @varnam_blog. The next carnival will be up on Sep 15th.